If you've been around the social services sector for any length of time, you've heard the following terms: performance outcomes, success indicators, program benchmarks, data submission, and accountability. Organizations face increased pressure to justify their programs via reporting in order to maintain funding and support. Government bodies and funders specify a range of reporting criteria that programs must adhere to, while program managers cross their fingers and hope the report numbers will convey the value of their programs and the work being done. This pressure-inducing scenario is, in many cases, unavoidable. When data are being aggregated across a particular sector or geographical area, specific reporting requirements help ensure that data submitted from multiple sources are consistent. For many organizations, compliance with these reporting requirements becomes a labor-intensive and time-consuming endeavor, and additional data analysis is often neglected as a result. This is unfortunate, as broader data analysis can be of great benefit to an organization and the clients being served. Mandated reporting typically gathers data for a period of one year or less, whereas analyzing data for a longer period can be useful for an organization to assess patterns and trends. For instance, how has the population being served changed over the past 10 years? What are some of the key demographic differences? Are new issues and needs emerging? Shawn Jamieson, an information technology consultant with extensive experience in the social services sector, believes this type of data analysis offers clear and practical benefits to an organization: "Long-term analysis shows what areas need more attention, and this in turn impacts staffing requirements." If your mandated reporting only requires that you look at data for a relatively short period, it's not going to reveal the changes developing over time. "Ultimately," Jamieson says, "data analysis is going to help you evaluate sustainability of service." Electronic records and software systems generally allow workers to record client information more quickly and efficiently than can be done on paper alone. 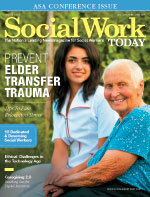 Web-based software tools also make it possible for social workers to easily access client information while out in the community. But if these are the only ways that the system is being used, the system and its data are both being underutilized. There's a wealth of valuable information available through additional data analysis. Most software systems have a mechanism for extracting all of the data items inputted, either through built-in reports or custom report-writing tools. This means an organization can analyze multiple variables and assess correlations between seemingly unrelated variables, without being limited to the criteria and constraints of their funders. For instance, a worker's increased time investment during the initial intake or assessment stage might reduce the total number of clients seen by the worker during a specified period—an apparent decrease in productivity, if one looks solely at the total number of clients seen. However, this increased time investment up front might contribute to more effective goal setting, higher levels of goal achievement, and greater long-term stability in target areas. If seeing fewer clients ultimately leads to improved outcomes in areas linked to key health indicators, this is a net gain for everyone. This is the type of data analysis that Geoff Hennessey, founder of Roxy Software Inc., would like to see organizations engage in. Hennessey has been providing software solutions to the social services sector for more than 10 years, and believes that the right type of data analysis can help organizations make a compelling case for continued funding in the midst of cutbacks. "Community support and crisis intervention both lead to cost savings for the larger health care sector," Hennessey says, "and that has far-reaching social impact and financial impact. If you can show a relationship between support services provided and decreased dependency on more costly health services, that's a major benefit to the health care system on a whole." This type of meaningful data analysis can be used to inform widespread program planning and the development of best practices. As Jamieson explains, "It's not just about numerical success; it's about the client's perspective. What's beneficial for clients is going through the system and successfully graduating out. This creates capacity." While there is no guarantee that the knowledge gained from such analysis will translate into an immediate increase in program funding, it can provide valuable insight into program strengths and areas to target for further development. It can reveal information that isn't always apparent during the course of day-to-day worker activities. It can also shed light on progress and program achievements. This information serves as a valuable tool in the hands of managerial staff for the purposes of program planning and evaluation. When communicated to frontline workers, this information is useful not only for providing guidance and direction, but also as a source of motivation by demonstrating how workers' daily efforts are contributing to the big picture. It's easy to see how the pressure to comply with mandated reporting requirements is felt by program managers and directors, who are held accountable for effective and efficient service delivery. However, this pressure often trickles down to frontline workers, as they are usually responsible for the related data entry that enables the required reporting. This happens in two ways. First, workers face the pressure to ensure that all of the required data are being inputted promptly, completely, and accurately. Combining data entry with direct client service time is a challenge, and as the data entry requirements increase, this challenge becomes even greater. A second source of pressure for frontline workers pertains to how the data entered are interpreted and what they convey—or fail to convey. Does the required reporting really capture the work being done? Does it capture specific achievements? Does the reporting explain the "why" behind time spent on various activities? In other words, can workers be assured that the report numbers are providing funders and stakeholders with a true picture of what's going on? Are the program's accomplishments and client successes truly being identified? Taking the time to perform some additional analysis on the data collected might not resolve these concerns and issues entirely, but it can help. It offers an opportunity to shine a light on performance, progress, achievements, and outcomes that are directly relevant to the program and its staff. For many organizations, limited time and resources are an ongoing challenge. When these conditions make it difficult to stay on top of mandated reporting requirements, the prospect of additional reporting and data analysis might not seem viable. Management staff is focused on strategic planning and high-level organizational priorities, social workers are busy on the frontlines working with clients, and on-site technical staff may or may not be present. But even in the midst of tight budgets and limited resources, there are workable solutions. Hiring a data analyst on a contract or project basis is one way to work within these constraints, as costs are kept down while the organization acquires access to specialized skills on a short-term basis. Partnering with another organization to share the services of a data analyst will reduce costs even further. Another option is collaboration between a group of organizations in order to make the most of limited financial, staff, and technical resources. Jamieson points out that this approach provides an added benefit for smaller organizations, as it provides them with access to a larger dataset for reference. Both Jamieson and Hennessey see collaboration between organizations as offering enormous potential, due to the increased technical options and cost savings it provides. As Hennessey says, "You've got multiple organizations collecting all this data—there's so much you can do with it. The data and the technology are there; you have the potential for some highly informative analysis to help guide program objectives." Most social service organizations have come to accept that required reporting is here to stay. For the purpose of widespread program evaluation and accountability across the sector, this type of reporting has an important role to play. But organizations need to be aware that beyond their required reporting, additional reporting and data analysis can be a huge asset. The data contained within an organization's software system can provide an increased understanding of program activities and client needs. With this valuable information, organizations are better positioned to strategize around managing staff, improving programs, and serving clients.